The Restore plays an important role in supporting Habitat for Humanity Invercargill’s mission. Find out exactly what a ReStore is, how you can get involved and more. The ReStore is a nonprofit home improvement store and donation centre. The purpose of the ReStore is to contribute to the work of Habitat for Humanity Invercargill. You’ll Find items that fit into your home. A very unique home improvement store. The items you’ll find will range from gently used to brand new, and there will likely be a wide range of brands and styles. How does the ReStore help the environment? Donated items are sorted, sold, recycled and kept out of the landfill. When a gently used material or household product is donated to the ReStore and then sold to a community member that needs it, that item is recycled and kept out of the landfill. What donations does the ReStore accept? The ReStore accepts gently used to new household items or other materials, which can include a wide variety of products. The ReStore donations come from all kinds of sources. The items accepted at the ReStore can vary for many reasons, including local requirements, store size and the amount of certain items we already have in stock. This is not an exhaustive list, but it is a good start to let you know what kind of items the ReStore accept if you are thinking about donating. Yes! We are open to the public. Stop by during business hours to see what kind of deals you can find, as well as to drop off your own donations. The ReStores does offer pickup services for many items. Please get in touch with our store to make sure we offer the service and currently are accepting the item or items you have available. How does the ReStore support Habitat for Humanity? The ReStore helps fund Habitat for Humanity Invercargill’s mission to end housing poverty by building strength, stability and self-reliance through shelter. Profits from the ReStore is put to use both in our local community and around the world. How can I support the ReStore? 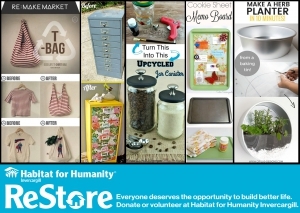 When you shop or donate at the ReStore, you are automatically supporting not only our store, but also the Habitat mission. Additionally, the ReStore is always looking for volunteers. We have wide range of tasks. There is something suitable for nearly everybody. Just like the items of the ReStore are different, so are the volunteer needs. Check with our ReStore to see what opportunities we have available. What are some examples of DIY projects made from items from the ReStore? Though at our store you’ll often find new or nearly new items that are ready to use as soon as you get it home, many also scour the ReStore for items that will be part of their next DIY or upcycle project. Check out the articles below to see just a few examples of the ReStore DIY projects and get inspiration for your next project!